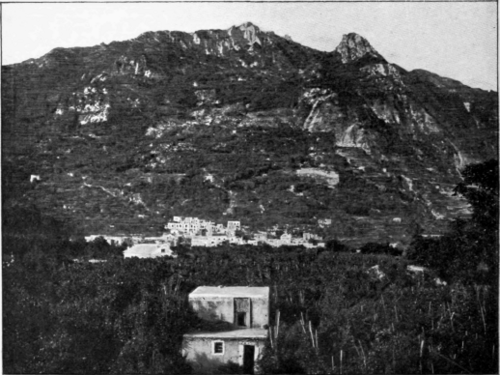 On one side Monte Epomeo rises abruptly from the sea, but toward the centre of the island its slopes are carefully cultivated and the whole country, from the level of the shore up to the shoulders of the mountain, has been transformed into a vast garden of olives, cherries, lemons, figs, and vines. 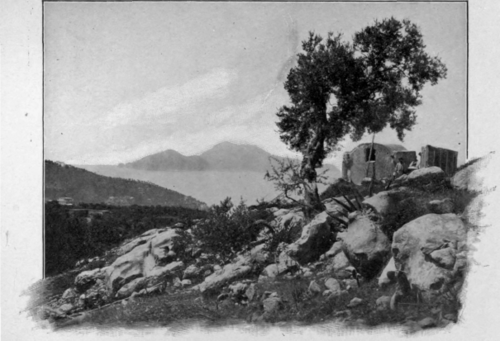 The view from the summit is unspeakably glorious; and, considering the beauty of the islands, sea, and shore, and the historic associations which enrich them, the series of magnificent curves which the Italian coast spreads out beneath the traveler's eyes, through a radius of fifty miles from Mount Vesuvius, has not its equal in the world, save, possibly, the view from Mount Pentelicus in Greece. I shall never forget an afternoon spent on the slopes of Monte Epomeo. Nothing disturbed my reverie and all the subtle fascination which the historic element in scenery exerts, when linked with natural beauty, held me for hours a willing captive; and, as I looked off from my book upon the classic sea, over whose surface distant sails were gliding slowly toward the setting sun, I felt that I was drinking deeply of a joy which might in after years prove a most potent opiate for care and sorrow. It was as sweet an hour as was ever numbered on the rosary of Time. Even when I had finally begun the descent to Casamicciola, I paused repeatedly to look back upon the enchanting scene. The sun was setting behind Capri, which lay in rose and crimson splendor on the surface of the ocean, like an emperor's barge. Above it, in a blaze of glory, the cloud-fleets spread their magic sails, and threw their radiant pennants to the breeze, as if to follow in the track of the departing sun. Strange legends seemed to glitter on those sails and banners, as if the annals of the matchless bay had been inscribed upon them; and I stood spellbound watching them, in perfect sympathy with the associations of the place, until at last the solar fires burnt themselves out, and left on the horizon nothing but the pale gray ashes of twilight, beneath which the aerial ships had vanished like a dream. More interesting even than Ischia, and certainly far safer as a place of residence, is the island of Capri on the other side of the bay. This, seen at any time, either when gilded by the dawn, mantled in purple by the sunset light, or turned to silver by the moon, is wonderfully beautiful. Moreover, few spots on earth can boast of more historic memories. This home of the Sirens became the home of the Caesars. 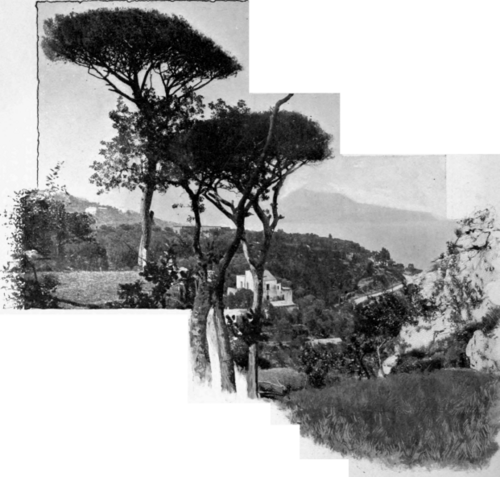 The Emperor Augustus was extremely fond of Capri, and made of it a bower of delight. 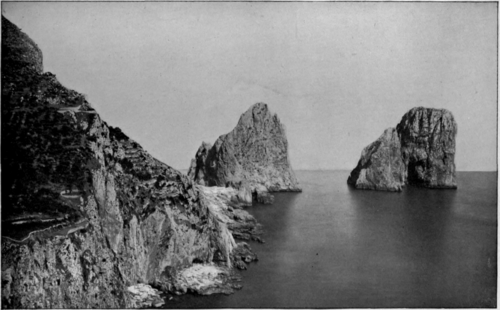 The poet Virgil, therefore, and his sovereign lived then directly opposite each other across the bay, - the poet at Posilipo, the Emperor at Capri. When Augustus died, this island was bequeathed by him to his successor, Tiberius, who, when he felt the end of his life approaching, came to this seagirt rock, in the twenty-sixth year of the Christian era, as a wounded beast crawls into a cave to die. Acting, however, as if he were to live indefinitely, he built upon these cliffs twelve splendid villas, each vying with its neighbor in magnificence, and all of them adorned with theatres, statues, groves, and gardens. In each of these palaces he lived a month, in turn, throughout the year, making this island for a time the centre of the civilized world, whence by a word or gesture he could spread terror through an empire extending from the moors of Scotland to the cataracts of the Nile. Of the imperial abodes which once stood forth above the jeweled water of the bay, like tinted alabaster in the setting sun, scarcely a trace remains; but eighteen hundred years have not effaced the memory of Tiberius. He is the evil genius of the place. Historians relate almost incredible stories of his cruelties and debaucheries. How sad this termination to a youth of promise! As a young man he was a famous general, a skilled diplomat, and a prudent governor; but supreme power, with its attendant risks and cares, gave him a haunting dread of being murdered, inclining him to orgies of unutterable dissipation, varied by outbursts of inhuman cruelty. What a significant fact it is that while this hated sovereign was living here, in shameless infamy, in one of the obscurest corners of his empire Jesus died upon the Cross! Moreover, it was here that Tiberius heard of the Crucifixion, if at all, from the Judean Governor, Pilate.